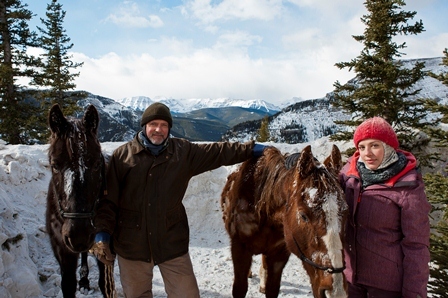 The Horses Of McBride airs December 16 on CTV | TV, eh? Saddle up this holiday season with THE HORSES OF MCBRIDE, a new, heart-warming CTV original television movie about the hope, spirit, and conviction of the residents of McBride, B.C., who sacrificed their Christmas to pull together and miraculously rescue two starving horses trapped deep within the Canadian Rockies. A major CTV holiday television event, filmed outside of Calgary and inspired by real-life events, THE HORSES OF MCBRIDE premieres Sunday, Dec. 16 at 7 p.m. ET/PT on CTV (visit CTV.ca to confirm local broadcast times). Written and directed by Gemini Award-winning director Anne Wheeler (BOMB GIRLS, Better Than Chocolate), and executive produced by Gemini award-winning actor/director Paul Gross (ZOS: ZONE OF SEPERATION, THE TROJAN HORSE) and Daytime EMMY® Award-winning producer Frank Siracusa (THE YARD, Hobo with a Shotgun, Passchendaele), the two-hour television movie stars EMMY®-nominated actor Aidan Quinn (ELEMENTARY, Unknown), Kari Matchett (COVERT AFFAIRS, 24) and up-and-comer MacKenzie Porter (R.L. Stine’s THE HAUNTING HOUR, WILD ROSES). Encore presentations of THE HORSES OF MCBRIDE air Wednesday, Dec. 19 at 9 p.m. ET on Bravo and Friday, Dec. 21 at 8 p.m. ET/PT on CTV Two. THE HORSES OF MCBRIDE will also be available across CTV’s digital platforms following its television broadcast on CTV.ca, the CTV App, and the CTV Mobile channel. Inspired by real-life events, in THE HORSES OF MCBRIDE (Dec. 16 at 7 p.m. ET/PT on CTV), cowboy-outfitter Matt Davidson (Aidan Quinn) has decided to sell his family ranch and find work in the city. His wife Avril (Kari Matchett) and son Kenny (Edward Ruttle, THREE WEEKS, THREE KIDS, HELLCATS) have embraced the move, but his daughter Nicki (MacKenzie Porter), who dreams of being an outfitter and mountain guide like her dad, is shocked and angry. It’s late December 2008, when two starving horses are discovered high up on the Rockies, trapped in a six foot-deep prison of snow more than 30 miles from any road. After seeing the spirit in their eyes, Nicki commits to getting them off the mountain – somehow. With no other options, she picks up a shovel and starts to dig out the mile-long path in deep snow, inspiring her father, family, and an entire community to pitch in. The story came to Whizbang Films’ attention on Boxing Day nearly four years ago when the horses’ story appeared on the front page of newspapers and newscasts across the country. Anne Wheeler agreed to write and direct the project, and in researching the story, she spent considerable time with the Jeck family in B.C, who were instrumental in the horses’ rescue. In casting the equine “stars” of the film, the producers found two emaciated horses with the support of the SPCA, and nurtured them back to health under the watchful eye of legendary wrangler John Scott. The mare’s name is “Lady”, rescued near Cochrane, Alberta. The gelding, “Slim”, was found near Penticton, B.C. THE HORSES OF MCBRIDE is produced by Whizbang Films in association with Bell Media, and distributed internationally by Entertainment One (eOne). THE HORSES OF MCBRIDE is written and directed by Anne Wheeler and executive produced by Frank Siracusa (THE YARD, Hobo with a Shotgun, Passchendaele) and Paul Gross (ZOS: ZONE OF SEPERATION, THE TROJAN HORSE). Gosia Kamela is the Bell Media Production Executive working with the movie. Trish Williams is Director, Drama, Independent Production, Bell Media. Corrie Coe is Senior Vice-President, Independent Production, Bell Media. Mike Cosentino is Senior Vice-President, Programming, CTV Networks. Phil King is President, CTV Programming and Sports. It was a wonderful story & more sure with knowing they rescued 2 horses that were in actual dire straits. I hope they have a wonderful life now.